When we first announced on the KBoards Writers’ Cafe that we were going to host a live online Q&A, authors seemed pretty enthusiastic — though some worried that the traffic would overwhelm the whole KBoards site! 445 posts and over 12,000 views later, we thankfully managed to avoid overloading any servers, but we definitely did go through much of our office’s coffee supply. Where will you be expanding internationally next? Carlyn from BookBub: We just expanded to Canada last week!! And we’re certainly hoping to expand to more English-speaking markets over the course of this year. Right now we’re thinking about Australia, India, and South Africa. Can you offer more specific feedback when a book isn’t selected? 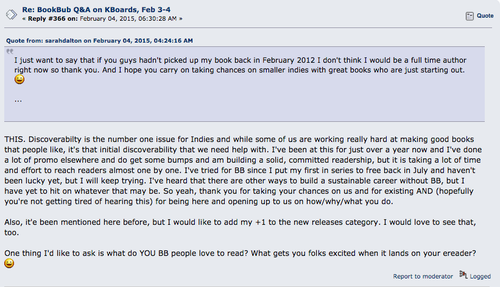 Craig from BookBub: Hi guys, I’ll give this one a try. We do actually give specific rejections for each of our basic guidelines. If your book is too short, you’ll get a rejection that says this is too short. If the pricing doesn’t work, we’ll tell you. If we’re out of space, we’ll send you an email that says we’re too booked, please resubmit in one week. And if we’ve accepted your book but we don’t have any openings during the dates you picked, we’ll send you an email offering you a different date! Where it gets complicated is for the books we don’t pick that do meet our minimums. SO much of the editorial process is based on timing because the editors compare all submissions in a given category to pick the best fits for our readers. Sometimes there are a lot of submissions for one category and very few spots open, driving up the standards for that category and forcing us to pass on books that we might take in four weeks, which is why we always encourage resubmissions. At other times we have spots open and can schedule the books we think are the best fit for readers’ current tastes, which we track based on historical performance of promotions we’ve run. Reader tastes change! Books about chihuahuas might be all the rage now, but books about golden retrievers might be all the rage in a couple weeks. We can’t predict these changes, so we do want to see the books that aren’t a good fit now in the future, when they might be a better fit! Do you have plans to feature shorter works, such as novellas? The Q&A was really helpful for us too! For example, we discovered that a lot of our authors would love to find a way to promote shorter works than we’re currently able to feature in the email, and we got some great suggestions as to how we could do that—such as featuring novellas as free books or starting short-fiction specific categories—which we’re taking back to the team to discuss. Should I resubmit for a different category if I’m not selected for my first choice? Katie from BookBub: Hey Lorena! There seems to be a lot of confusion about this, which is totally understandable. The categories you guys select on submission forms are actually just suggested categories. Our editors will consider the title for whichever genre they think it would work best in, so submitting for different categories or multiple categories won’t actually impact their decision. IF you are open to running in another category, it is helpful for us to know that in the submission in case the editors think it will work better elsewhere (you can just throw that in the comments section). Otherwise we’ll just ask you if you’re ok running to a different list! What genres are you considering adding as new categories? Katie from BookBub: We just recently launched two new categories: Parenting and True Crime, and we have a couple more nonfiction categories we’re currently testing (History and Business). We hope to launch those soon as long as the testing goes well! How do customer and editorial reviews factor in the editors’ decision process? Mel from BookBub: Hello Rue! When our editors are evaluating a submission, book reviews fall into two different camps: reader reviews and critical reviews. As we mentioned earlier, the editorial team checks out Amazon and Goodreads to get a sense of a book’s platform (number of authentic reviews, average star rating, etc.). In terms of critical reviews, the editors are looking to see if a book has been positively reviewed by established publications and/or credible authors that we know our subscribers enjoy. Looking at the big picture, I’d say reader reviews oftentimes better inform the editorial team’s decision, unless your title has been reviewed by a big publication like The New York Times (although that’s not to say it has to be!). What should I put in the “Additional Comments” section of my submission? Sonja from BookBub: Hey there! Excellent question. We could definitely do a better job of explaining what’s useful to put in the additional comments section. The editors will read a book’s product page VERY carefully, so there is no need to include awards, editorial reviews, endorsements, and other information that’s already on that page in the Comments section of your submission. However, if there’s some new information that you haven’t yet added to the product page, that’s a great thing to mention in your comments section. Also, if your dates are generally flexible but there are a couple dates that don’t work for you, that’s something you might want to mention as well. Hope that helps clarify! Will you promote audiobooks in the future? The problem for us (BookBub us) is that audiobooks aren’t discounted in the same way as ebooks. It happens, but it’s rare to see deeply discounted audiobooks unless the purchase/download is part of a trial for a subscription service. We don’t want our readers accidentally signing up for a subscription service that they don’t want! We have been asking about audiobooks in the surveys, but this has been just to get a sense of whether or not our indie author friends have audiobooks and where/how they’re distributed. TL;DR—there is a lot of figuring to do before we could make this happen. Would BookBub ever consider promoting new releases? Katie from BookBub: Hey Teresa! Thanks so much for your feedback. We’re very happy to hear you’ve had successful BB promos in the past :D.
We’re also happy to hear about all the interest in featuring new releases. It’s not something we’re going to introduce into the existing email in the near future, but I promise we’re working on other ways to help you guys get new books out there! Stay tuned. What does the BookBub team like to read? Mel from BookBub: I’ll jump in here! Personally, I’m a huge fan of nonfiction. And I studied Latin American literature as an undergrad, so I’d be remiss if I didn’t mention some of my favorite LA authors: Gabriel Garcia Marquez, Borges, and Junot Diaz. Katie and I were both super psyched about the launch of our True Crime list (in fact, I think you’ll find a copy of a book we recently featured on BookBub — Why We Love Serial Killers—on both of our Kindle homepages 😉 ). The team also gets together once a month for a book club. We always read a recent BookBub title — last month, our pick was In the Garden of Beasts! These are just a few of the hundreds of questions we answered, so please feel free to check out the entire thread here on KBoards! Thanks again to KBoards and to everyone who participated!